The Houma-Thibodaux MSA is booming with commercial and industrial development, especially along the Hwy 90/Future I49 corridor. Site selection is critical for economic success. And so is choosing the right professionals to assist you. Nearby new residential development includes Highland Oaks (239 residential lots being developed), Wallace J. Thibodaux Estates (final phase of 74 residential lots being developed to the 178 existing, developed lots), Northpark Subdivision (67 residential lots in Phase 1 developed), and Williamsburg Subdivision (68 residential lots in Phase 1 developed). 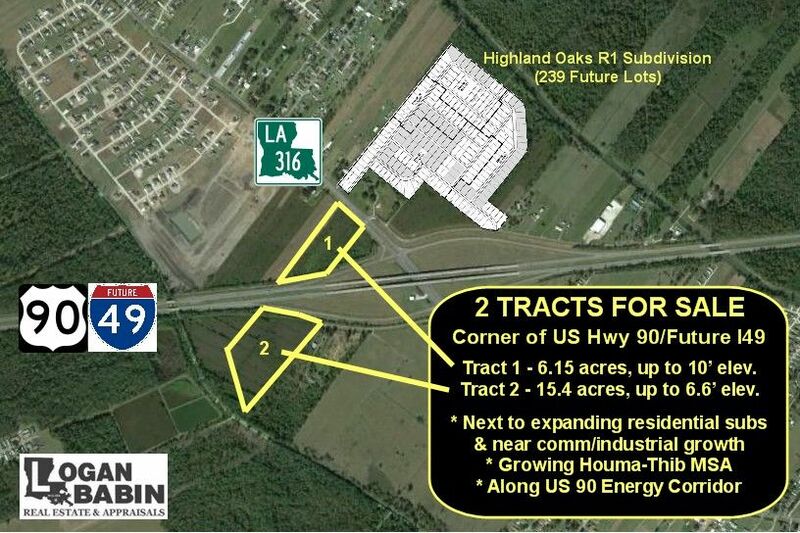 Nearby commercial/Industrial development at US Hwy 90 interchanges includes a new corporate headquarters for Danos, a 60-acre complex for Schlumberger, light industrial office parks with dozens of new buildings, a new plant and offices for K+B Machine and also Hunting off of Hwy 311, and a new office for Laborde Marine. The Houma-Thibodaux MSA consistently has one of the lowest unemployment rates in Louisiana and has an 8 Parish retail draw of almost 450,000 people. It was recently ranked #6 of all nationwide mid-sized MSA’s by Area Development Magazine (May 2013) and was #24 overall out of 380 MSA’s in the U.S. This follows a January 2013 article in Forbes magazine naming Louisiana “America’s New Frontier for Business Opportunity”. In 2014, Houma was ranked as the 2nd Happiest Place to live in the U.S., Louisiana was ranked #1 in Business Climate by Business Facilities Magazine and #2 in Business Climate by Site Selection Magazine. If you are in the market to buy or sell commercial or industrial real estate, give our team a call at 985-872-4597. You will soon see why we say: Logan Babin Real Estate – Local Knowledge. National Reputation. This entry was posted in Houma, Houma Terrebonne Lafourche, LA Commercial Real Estate News, Louisiana Commercial Real Estate, Louisiana Industrial Real Estate and tagged Hank Babin, Houma Terrebonne Commercial Industrial Real Estate, Houma-Thibodaux MSA, I49 Corridor, Logan Babin Real Estate, Louisiana Economic Development, U.S. Highway 90. Bookmark the permalink. Both comments and trackbacks are currently closed.